First calendar which I will show you today is Chalk Calendar 2015. At my shop Design On A Lara it is sold as completed printable product, available in 2 size: Letter size 11 x 8,5 inch and A4 size. At Artscow it is available, as DIY calendar 2015 kit. This scrapbook kit includes additional chalk dates. Where you can arrange calendar by your choice. Chalk Calendar 2015 is free at Artscow (Scrapbook kits can be used in photo books, calendars, and other photo gifts. Just click "Add to My Kits", it will show up in both "My Kits" and Silverlight Photobook Designer's Kits section. Therefore, add your favorite free kits to "My Kits", they will be free for lifetime in your account. Even the kits designers change to paid kits later, it will still remain free in your account). 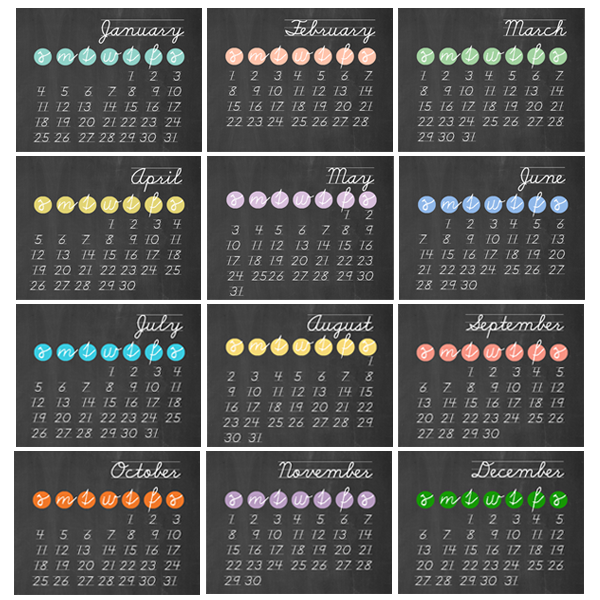 For today FREEBIE, all months with dates on chalk board background. Download and enjoy them, by your choice! Публикувано от Unknown в 21:39 ч.